Preparing for exams can be difficult for a variety of reasons. These tips can help you be focus yourself (mentally and physically) while studying and during the exam. Be prepared. Pace your studying throughout the semester rather than waiting until the last minute. Get plenty of rest and eat healthy meals the days before your exam. Be positive. You studied thoroughly - you can do well on the exam. Read the directions carefully and follow them. How long is the test? How much time will I have to complete the test? What is the point value of each question? Do I need to split my time between multiple choice and essay answers? Answer the rest of the questions making sure the exam is complete before you turn it in. Learn from your incorrect answers. If your exam is returned to you for you to keep, review your incorrect answers and study those concepts in more detail. Start preparing for the next test the day after you take the prior one. Daily preparation is crucial. At a minimum, review material once every week between exams. Every day before class, preview the material for 15-20 minutes. Attend every lecture. Seems simple but it's the biggest mistake students make. Take good notes. Learn how. Spend another 20-30 minutes after class going over the notes. Use this time to get any confusing points cleared up in your head; much better now than later. This will make later exam prep. MUCH easier. Once a week, review the material to get a more complete overview of the information. What is my schedule like during the week of the exam? Do I have other exams or papers due? Will I have all week to prepare or will I have to study over the weekend? How many pages of notes are there? How many chapters do I have to read? How much material will I cover each night? How much time will I spend studying with a friend? When are the review sessions? Will the Prof. or TA be available to answer any questions that come up? 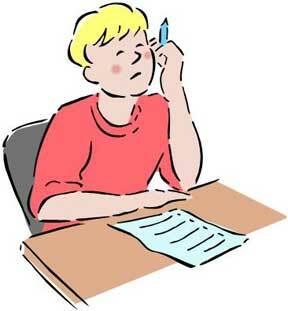 Get a blank piece of paper and outline the material you need to study. This helps develop a "big picture" overview of the material. Start with big topics and leave room for subtopics. Fill in the information as best as you can. Get another sheet of paper and start over if necessary. Once you see all the units of information in front of you it will be easier to organize your studying. This will help you with the next step. Break the material into smaller chunks and study each one. Only once you understand each one should you move on to the next. Do this part alone in your quiet study place. This is when you start to memorize the information you'll need later. Write down any questions that you may have. The next step is to work with someone else to clarify anything that's confusing. Work with others, go to review sessions, see a tutor, or work with the professor or a TA. At this point it's important to make sure that everything is clearly understood. This is crucial. If this step is skipped then you're left with trying to memorize hundreds of useless factoids. It will never mean anything to you later. Now it's time to put the information into your brain for retrieval. If you've been working all along you will already remember much of it. Make sure nothing is left out. Review the tips on memory. Many students focus on this step exclusively. It's called cramming. Just say no. This next step is not needed by everyone but it's useful if you are having trouble with the course. You've been studying for hours and hours but, do you really know anything? Try working with someone else who will ask you questions about the material. If you can answer and explain concepts without too much effort then you're in good shape. Usually this help to expose areas that require more attention and study. If the previous step went well then all you have left is to work on weak areas and a general overview the material. If you didn't do well explaining the material you'll need another round of steps 4 and 5. Hopefully you left time for this in your study schedule. If you planned well and kept up with the work there should be little anxiety the night before an exam. If you started late or waited to get questions answered then you'll be busy the night before. This will add extra stress and you'll likely make stupid errors on the exam. At the very least you'll be more susceptible to getting sick which will worsen your situation. The only thing that should be going through your mind the night before is a sense of confidence. It's ok to be a little afraid or anxious but not panicky.